Ocean Life Comes in All Sizes! Ocean Life – Large and Small! Now this is the life! Fresh air, wind in your hair, and a great view of the ocean. Last evening while lounging an ocean visitor came by. My friend, Whale, came to put on a short show for us. He swam across the front of the ship and then came down the left side (in sailor talk that would be the port side). I think that he wanted me to tickle his tummy because he rolled over and sort of waved as you can see in the photo. He even stuck his head out of the water to get a better view of us (photo below). 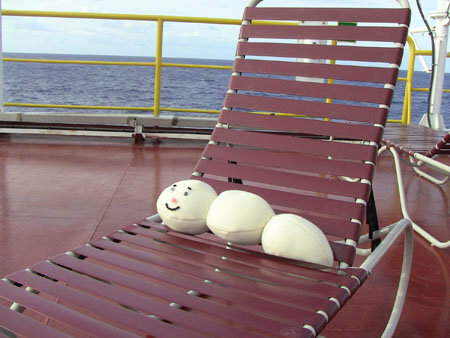 The scientists on board are interested in my little friends, the microbes, but I kind of like the big friends better. They are not microbes but that is fine with me! And speaking of friends, David Smith is a microbiologist and he is interested in where the microbes get their energy. In his lab, he is looking for evidence that the microbes use hydrogen as a source of energy. He puts some sediments into container, adds distilled water and a small bubble of air with no hydrogen in it. Then he lets it sit for awhile. The sediments have a small amount of radioactive elements in them and the radiation separates the water molecules into hydrogen gas and oxygen gas. If microbes are in the sediment, they will use up the hydrogen that forms. If microbes are not in the sediments, the hydrogen gas will collect in the little bubble. This is not proof of the microbial activity, but it is a hint of what could be going on and this is how science is often conducted.